Pamellia here to bring you the Winner and Top 3 from my 'Christmas Leftovers' Challenge. I was just blown away by the spectacular projects that I saw last month! I've never seen so many crafty uses for leftover bits in all my life! I would like to thank everyone who raided their recycle bin and turned garbage into art! What a talented group of artists you all are! Congratulations Karen!!! 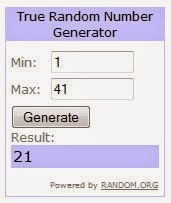 We hope you have a lot of fun with your prize! I fell in love with this project the moment I saw it! 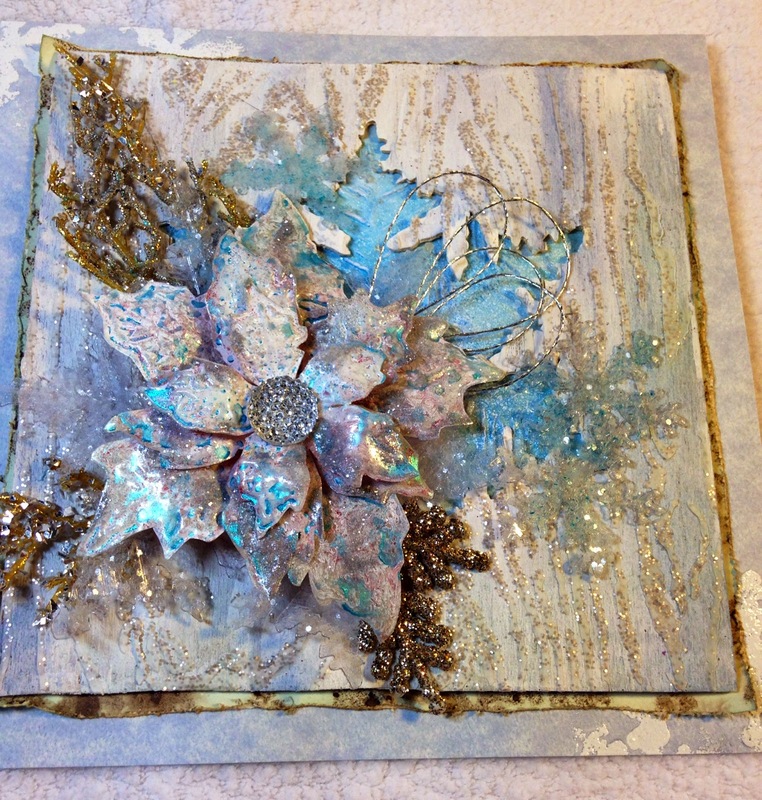 Such a gorgeous card full of frosty layers and shimmery bits, a work of art by anyone's standards! Glamour and grunge married together, what a beautiful sight! There are so many wonderful textures and frosty metallics, I dare you to not to ooh and ahh! Sara really captured the spirit of my challenge, she used so many leftover Christmas bits on her project and in such creative ways. Acetate packages, bit and bobs from the Christmas tree, gift packaging...every piece of this stunning card came from something that might otherwise have ended up in the trash. There was just no denying the work, creativity and brilliance that went into this stunning card! Every detail thought out and carried out with incredible style and flair! Well done Sara Emily and Thank You! Cec's amazing sewing kit was originally a Christmas gift card tin! Can you believe that, what an amazing use of an item that would normally go in the garbage! 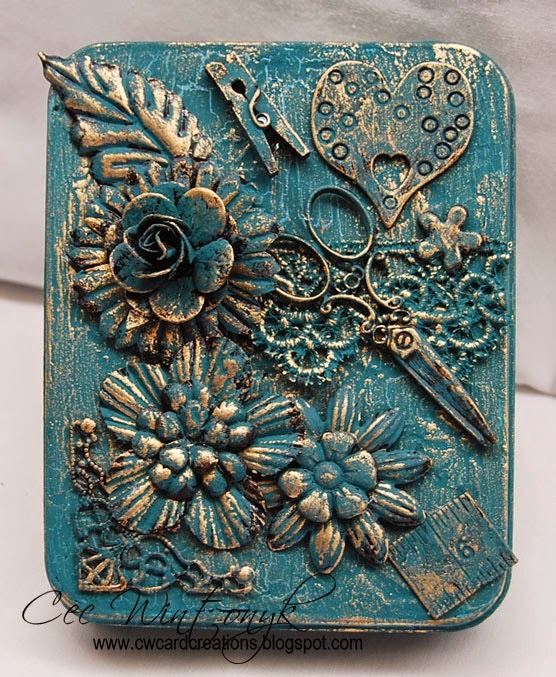 I just love the aqua and gold palette and there is so much detail on such a tiny surface, absolutely fabulous project from top to bottom! 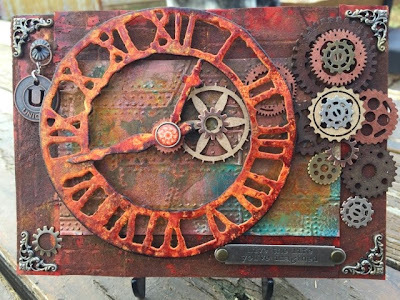 Niki's steampunk work of art was made out of lots of leftover Christmas bits, including one of my favourite ideas for recycling ever...her 2014 calendar!!! WHAT!!! Absolutely incredible! There are so many wonderful textures and details here that I had a hard time looking away once I saw it! Spectacular job! I almost fell over when I discovered that this gorgeous wintery book was actually made out of a leftover shortbread cookie box and textured with leftover tissue paper!! AMAZING!! I just love the frosty colours and the wonderful techniques used to create this fabulous project! Thanks so much to all who entered my 'Christmas Leftovers' challenge. There were so many wonderful projects to choose from, I really wish I could have featured more of them! Oh, MY WORD!!!! 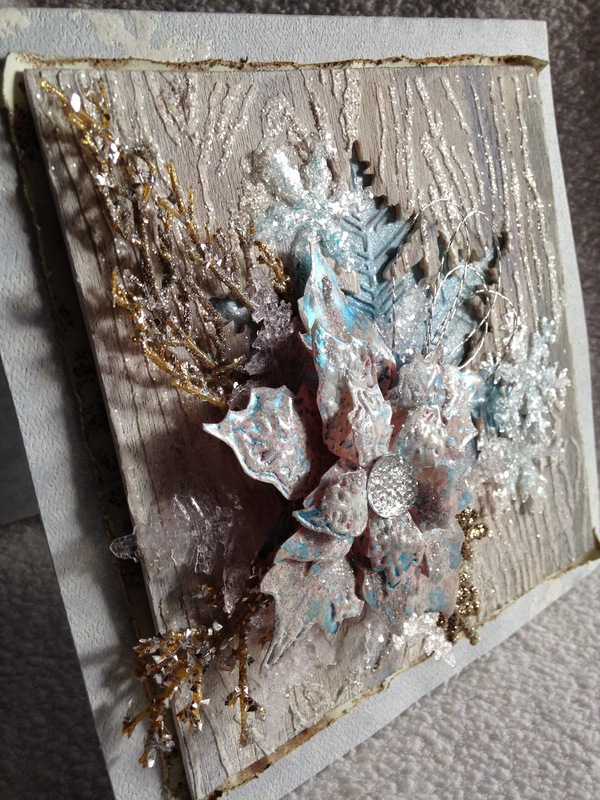 I cannot believe my Frosty card was chosen for Our Creative Corner's challenge for Christmas Leftovers! Thank you, Pamellia, for choosing this to be a favorite and for all your amazing compliments about this piece! My head is so huge, it will be impossible to get up off the floor, where I have just landed after learning about winning! This was indeed such a fun challenge to use up those scraps and other tidbits I simple could not dispose of! Well done, Karen--enjoy your prize! And Cec, Niki, and RosA, I am humbled and honored to be among your wonderful entries in the winning line-up! Your projects are all spectacular! Bravo! Congrats to the winner, and the top 3! Amazing projects from everyone, congrats to you all! Sara's project is simply stunning Such a well deserved win!!! All your artwork is really lovely and creative. Congratulations to all of you. j.
Congrats to the lucky winner and fabulous top three Pamelia, wonderful creations by those talented gals! Congratulations ladies! Sara Emily your card is wonderful, a well deserved won! Congratulations also to Karen, Cec, Niki, and Rosa. Thank you for all the lovely comments here and on my blog! Hugs!